Climate protesters demonstrating against Donald Trump’s plans for a sports resort broke into a Scottish airport Tuesday, setting up a small golf course and scaling the roof of a terminal building. Flights at Aberdeen airport were returning to normal by midday after the activists breached the security fence overnight, the airport authority said. 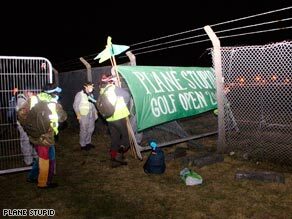 Nine members of Plane Stupid, which campaigns against airport expansion and aviation-related climate change, entered the airport grounds at about 2:15 a.m. Tuesday (9:15 p.m. Monday ET), the group said. A spokesman for the airport called the protest “dangerous and highly irresponsible.” By mid-morning, the seven members on the ground had been arrested, but the two protesters remained on the roof, group spokesman Leo Mullay told CNN. He explained that the group is against plans to expand the one-runway airport for the American millionaire’s planned golf resort in the region. “It’s going to cause a huge increase in emissions,” Mullay said. “There’s simply no capacity within our carbon budget for more flying.” Trump’s plans call for a golf resort to be built on 1,400 acres along Scotland’s northeast coast, just north of Aberdeen, according to the resort’s Web site. Trump International Golf Links, Scotland, is to feature two championship-caliber golf courses and a five-star luxury hotel. Trump’s resort is in the planning stages, project director Neil Hobday told CNN. But he rejected the idea that the airport is expanding because of the Trump resort. “The runway issue has been going on long before we got here,” Hobday told CNN. It’s “nothing to do with us. They were going to lengthen the runway whether we were here or not.” The protest caused a backlog of flights at the airport, a major gateway for Scotland and one of Europe’s busiest heliports, airport officials said. Outbound flights resumed just after 9 a.m. (4 a.m. ET), but there remained some delays and cancellations, according to the airport’s Web site. “Despite the runway being open and available for use, the earlier protest is likely to cause some knock-on disruption during the course of the day and passengers are being asked to check the status of their flight,” an airport statement said.